The ongoing evolution of Next Generation Sequencing is revealing ever more of the complexity of genomes, gene expression, and gene regulation. To harness the considerable potential of this technology for creating biologically relevant information, data generation must be matched by analysis tools and strategies which integrate and consolidate the available lines of evidence into scientifically interpretable results. 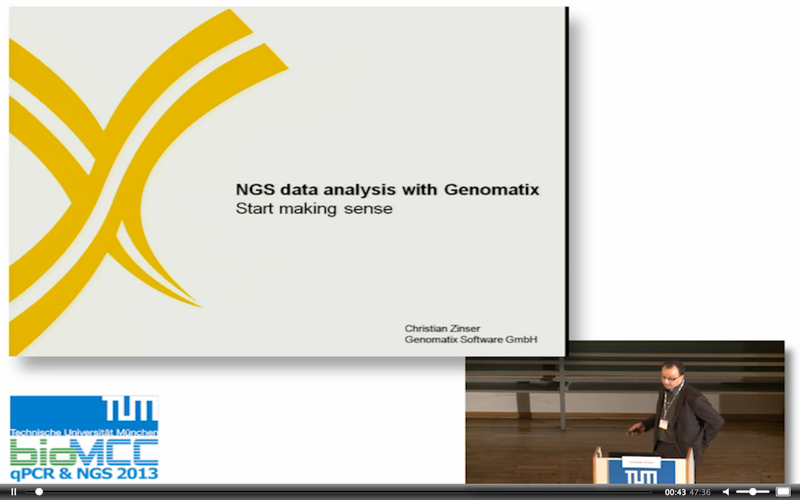 This talk provides an overview of the solutions offered by Genomatix for the analysis of Next Generation Sequencing data. Examples will include the application of the above to the study of cancer, the identification of the basis of hereditary diseases, and the elucidation of disease-relevant regulatory networks. Are you struggling to get your qPCR data-analysis right? Do you want to speed up your analysis? 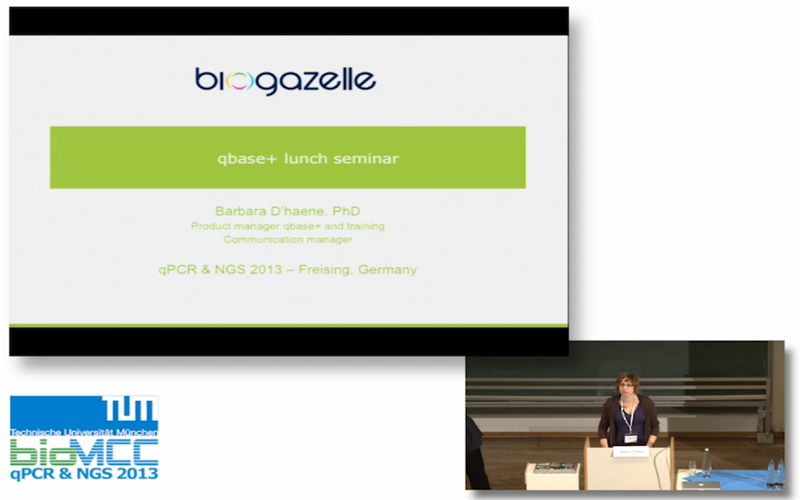 Join Barbara D’haene, PhD, for a lunch talk and get access to qbasePLUS. During this session Barbara will show how to analyse a qPCR experiment using qbasePLUS. 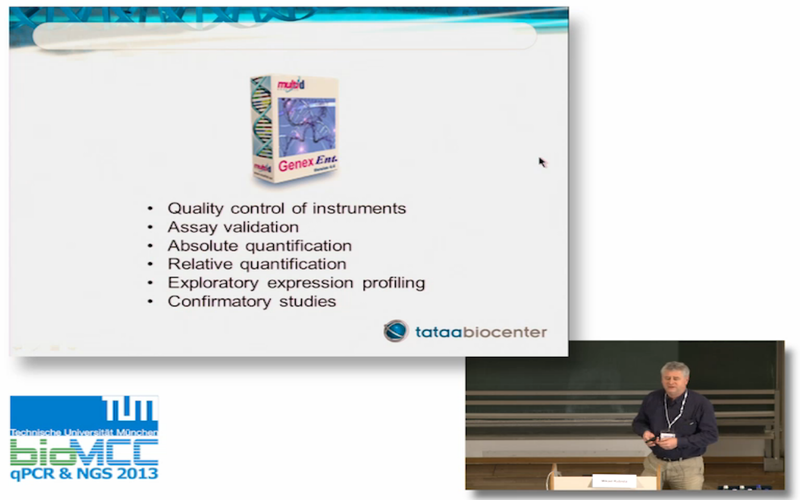 The key points demonstrated will be quality control, normalization and easy biostatistical analysis. qbasePLUS is based on the proven geNorm and qBase technology. 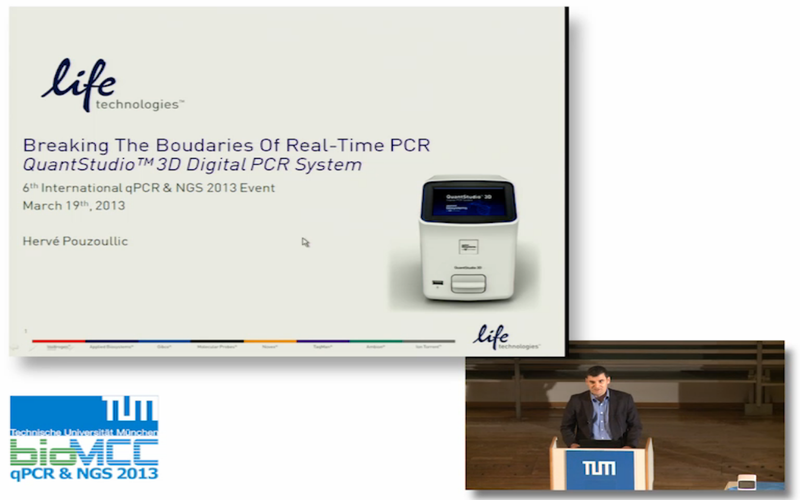 The software is developed at Biogazelle by recognized qPCR experts Jo Vandesompele and Jan Hellemans. Biogazelle is a young and dynamic PCR company, eager to accelerate the discoveries in the PCR community. True digital (i.e., counting based) multiplexed gene expression can currently only be performed using RNA-seq or optically-barcoded single-nucleic-acid counting (nCounter technology). We demonstrate that a simple modification to the nCounter protocol enables digital quantification of 800 unique transcripts in a single cell, offers several potential advantages relative to single-cell microfluidic PCR, and much better counting statistics than single-cell (or normal input) RNA-seq (when compared to whole transcriptome). The nCounter Single Cell protocol incorporates reverse transcription and linear pre-amplification (10 to 18 cycles) with a highly multiplexed pool of up to 800 gene-specific primer pairs in a single tube, followed by hybridization with optically-barcoded nucleic-acid-labels. Microfluidic qPCR methods require the same pre-amplification step, but must be followed by splitting the amplified sample into 96 separate wells and performing an additional series of up to 40 PCR amplification cycles. nCounter technology requires no sample-splitting (a true multiplex) or additional amplification cycles and (compared to RNA-seq) doesn’t require library generation because single-molecules are counted directly. Gene-expression measurements of flow-sorted single-cells using nCounter, revealed the stochastic “on-off” behavior. The “summed” (aggregate) gene expression profile from multiple individual flow-sorted cells was (essentially) identical to pools of multiple flow-sorted cells (10 per tube and 100 per tube), proving digital linearity of 800-targets at the single-cell level for the first time. When comparing to RNA-seq (whole transcriptome), nCounter (on panels of 100’s-of-genes) resolved a constant ~ 2 million on-target reads per sample (~10,000X coverage), compared with < 100,000 on-target reads for RNA-seq (as expected for a non-targeted approach). Hundreds-to-thousands of single-cells, 800 targets-each, can be examined per-week on an nCounter system: enabling single-cell digital biology. We use fluorescence in situ hybridization to provide highly specific and direct detection of individual RNA molecules via fluorescence microscopy in their natural context in cells and tissues. This method enables absolute quantification of gene expression in single cells, and we discuss how to interpret these measurements. We highlight the detection and localization of long non-coding RNAs. We also have extended our assay to detect chromosome structure and gene expression at the same time, enabling per-chromosome transcriptional profiling. We also present a method that allows us to measure single-base differences on individual RNA molecules. The single cell represents the basic unit of all organisms. Most investigations have been performed on large cell populations, but understanding cell dynamics and heterogeneity requires single-cell analysis. Current methods for single-cell analysis generally can detect only one class of analytes. Reverse transcription and the proximity ligation assay were coupled with quantitative PCR and used to quantify any combination of DNA, mRNAs, microRNAs (miRNAs), noncoding RNAs (ncRNAs), and proteins from the same single cell. The method has been demonstrated on transiently transfected human cells to determine the intracellular concentrations of plasmids, their transcribed mRNAs, translated proteins, and downstream RNA targets. We developed a whole-cell lysis buffer to release unfractionated DNA, RNA, and proteins that would not degrade any detectable analyte or inhibit the assay. The dynamic range, analytical sensitivity, and specificity for quantifying DNA, mRNAs, miRNAs, ncRNAs, and proteins were shown to be accurate down to the single-cell level. Correlation studies revealed that the intracellular concentrations of plasmids and their transcribed mRNAs were correlated only moderately with translated protein concentrations (Spearman correlation coefficient, 0.37 and 0.31, respectively; P < 0.01). In addition, an ectopically expressed gene affected the correlations between analytes and this gene, which is related to gene regulation. This method is compatible with most cell-sampling approaches, and generates output for the same parameter for all measured analytes, a feature facilitating comparative data analysis. This approach should open up new avenues in molecular diagnostics for detailed correlation studies of multiple and different classes of analytes at the single-cell level.We will also discuss how single-cell data can be used to gain detailed information about cell types and cell states. DNA sequence analysis and genotyping of biological samples using next-generation sequencing (NGS), microarrays, or real-time PCR is often limited by the small amount of sample available. A single cell comprises only one to four copies of the genomic DNA, depending on the organism (haploid or diploid organism) and the cell cycle phase. The DNA amount of a single cell ranges from a few femtograms in bacteria to picograms in mammalia. In contrast, a deep analysis of the genome requires a few hundred nanograms up to micrograms of genomic DNA. Consequently, accurate whole genome amplification (WGA) of single cell DNA is required for reliable genetic analysis (e.g., NGS) and is particularly important when genomic DNA is limited, as in single cell WGA. The use of single-cell WGA has enabled the analysis of genomic heterogeneity of individual cells (e.g., somatic genomic variation in tumor cells). (1) Proofreading activity (up to 1000-fold lower error rates compared to Taq polymerase), (2) Strong processivity (resulting in minimal enzyme dissociation at difficult structures such as GC rich regions), (3) Strong DNA displacement activity (resulting in solving hairpin structures). Here, we describe the reliability of this single cell WGA method and its application to next-generation sequencing (NGS) and real-time PCR. The stochastic nature of generating eukaryotic transcripts challenges conventional methods for obtaining and analyzing single-cell gene expression data. As part of a study exploring the effect of genotype on Wnt pathway activation, data were collected for 96 qPCR assays on individual cells from 15 genotyped lymphoblastoid cell lines (HapMap lines). For each cell line, qPCR was used to obtain single-cell gene expression profiles for 48 baseline cells and 48 stimulated cells. Thus, data were collected from a total of 1440 single cells. The methods used in the collection and analysis of single-cell qPCR data will be contrasted with those used in conventional qPCR. The generation of RNA libraries from hundreds to thousands of single cells has been simplified by introduction of the C1™ Single-Cell Autoprep System (Fluidigm). This system captures up to 96 single cells and performs the processing steps of cell lysis, cDNA synthesis by reverse transcriptase, and initial amplification to generate libraries for qPCR or RNA-Seq analysis. Recent studies suggest that our genome is pervasively transcribed and produces many tens of thousands of long non-coding RNAs (lncRNAs). These lncRNAs have been implicated in gene expression regulation through direct interaction with chromatin modifying complexes and their subsequent recruitment to target loci in the genome. To date, only a handful of lncRNAs have been described with dcoumented functions in cancer biology. However, their critical role as regulators of gene expression suggests that lncRNAs, much like microRNAs, might be key components of different cancer pathways. In order to study lncRNAs in cancer, we designed and extensively validated a high-throughput RT-qPCR lncRNA expression profiling platform capable of quantifying over 1700 lncRNAs in a single run. 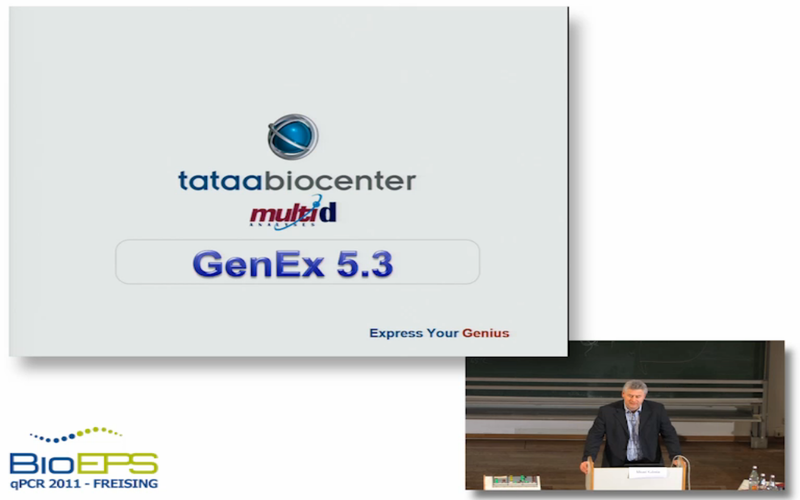 This platform has been applied to identify lncRNAs downstream of two major cancer genes, MYC and TP53, by means of inducible model systems. Furthermore, we measured lncRNA expression of the entire NCI60 cancer cell line panel. Both MYC and TP53 were found to directly induce lncRNA expression through direct promoter binding. The findings were validated in primary samples and model systems of different tumour entities. From the NCI60 panel, we identified cancer specific lncRNA signatures, reminiscent of lineage survival oncogene expression patterns. Together, our results suggest that RT-qPCR is a valid screening approach for high-throughput lncRNA quantification revealing multiple candidate cancer lncRNAs.